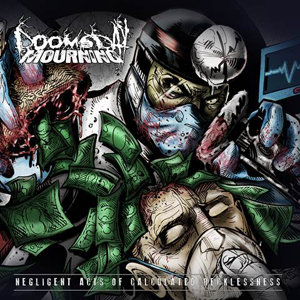 New York’s grimiest underground metal band, DOOMSDAY MOURNING, is back and more brutal than ever with their new full-length album Negligent Acts Of Calculated Recklessness, available now via To The Point Records. Find it now on iTunes Amazon, Spotify, Rdio, tothepointny.com and more. Today also marks the web release of the band’s brand new single "Perception Management" featuring Jayden Panesso of fellow Queens, NY metal band SYLAR. Check out the single now via the band’s Facebook page at www.facebook.com/doomsdaymourning. Negligent Acts Of Calculated Recklessness also includes the band’s recently released single "An Exercise In Futility", now available via iTunes, Amazon, Spotify, and more. You can watch the official lyric video for the track below. Negligent Acts Of Calculated Recklessness is filled with some of the best brutal riffs and tech slam’s known to man, which is what DOOMSDAY MOURNING does best. The record also includes several notable cameos by artists like Jayden Panesso of SYLAR, Jake Wolf of REFLECTIONS, Noah Friend of WORLD OF PAIN, Dan Schuy of PSYCHO ENHANCER and AJ Channer of ASHES WITHIN. DOOMSDAY MOURNING is an urban-influenced, no holds barred, metal onslaught from Queens, New York. Since their inception in 2009, the band has taken the metal scene by storm, utilizing their punishing grooves and brutally honest lyrics. Built on a foundation of street credibility, dark intensity, and sheer brutality, DOOMSDAY MOURNING continues to unfold in new and creative directions. While having only released two independent EPs (The Science Of Exploitation (2010) and Culture Of Corruption (2012) with guest spots including Frankie Palmeri (EMMURE), Ronnie Canizaro (BORN OF OSIRIS), Ricky Armellino (THIS OR THE APOCALYPSE), among others, the band has gained worldwide notoriety and a rabid fan base. 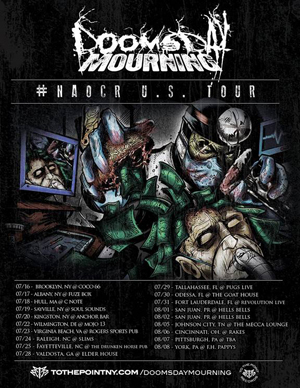 Since their inception, DOOMSDAY MOURNING has shared the stage with bands like IMPENDING DOOM, DISEMBODIED, VISION OF DISORDER, REMEMBERING NEVER, NORMA JEAN, OCEANO, THE GHOST INSIDE, XIBALBA, CHELSEA GRIN, STICK TO YOUR GUNS, STRAY FROM THE PATH, FIT FOR AN AUTOPSY, LIONHEART and THIS OR THE APOCALYPSE. Visit: tothepointny.com/doomsdaymourning for more info.